I have new glasses and the world looks very odd. All my possessions have grown smaller yet the room is wider. I thought I had a medium sized laptop but it turns out it's quite small. I might even have suggested it could fit in a shoulder bag - if my shoulder bag hadn't shrunk too. I've also bought a pair of prescription sun-glasses. The moment I put them on, my eyes relax. People who are surprised when they come across me staring into hedgerows are likely to be even more disconcerted now I have a spy-like appearance; for it's the sunglasses I'm wanting to wear all the time, even on cloudy days. It's May Day. The sun is shining. I can hear thunder. This is supposed to be a book review. I love this book. I like this book so much I've been carrying it around with me. It's called 'the salad garden' (without capitals) and it's by joy larkcom (she doesn't have capitals either). A while back I realised that, when reviewing a book, I tend to pay more attention than other bloggers (maybe undue attention) to the appearance, the weight, the size and the smell of a book. In part, this is because I guess gardeners fall into three categories: the mega gardeners who know everything, the middle gardeners who know what they need to know, and people who would like to garden, or dream of gardening. The mega-gardeners don't need books. The middle gardeners will already have a few instructive manuals and consult seed-packets, aspiring gardeners will look for inspiration - and to be inspired the look and the feel of a book matters. 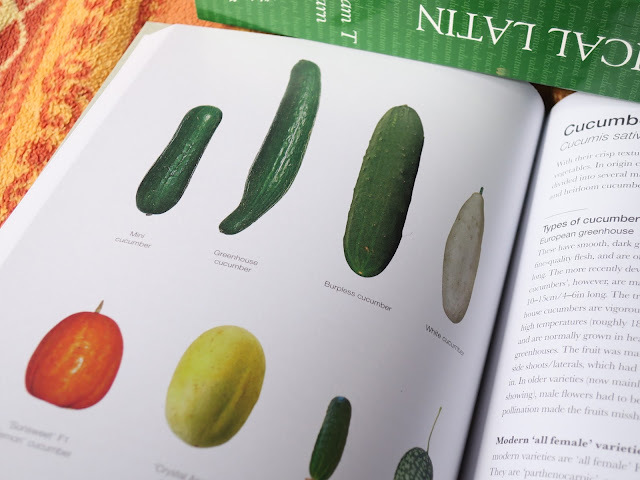 This salad-growing book seems to be a sort of cross-over in that new gardeners and dreamers thinking about what salads they might grow may be surprised and delighted to find out that cucumbers and peppers come in a variety of shapes and sizes, and middle-gardeners may be inspired to try out some of the recommended varieties. Both groups might find the crisp description of Cucumber Mosaic Virus helpful. "This aphid-borne disease causes mottled, yellowed and distorted leaves; plants may become stunted and die. Remove and destroy infected plants and where possible control aphids. Varieties with a degree of resistance are becoming available." "Cucumbers grown under cover are very susceptible. 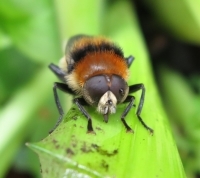 Use biological control as soon as any signs of attack are noticed." There's loads of the usual information: design, water retention, frames, a little bit of cooking. But rather than feeling these have been stuck in by format or padding, there's the sense that it's an all-in-one book . 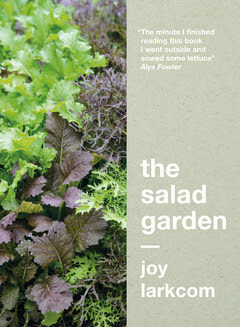 . . that if you want to grow salads you can put this on your shelf as a pleasure and a reference. Shelf - yes. Here's something that matters. I don't know what the average shelf-life of a picture-book is. There are wonderful books about gardens that take a lot of space and I don't know whether people treasure them for life or give them to charity shops when their novelty has worn off. Some books do need to be tall; some pictures, some diagrams, need space to make sense. But the problem with this is that most shelves don't accommodate tall books. I have had bookcases made to measure. One was made precisely to contain the tallest book I happened to own at the time. But I'd say this is unusual. Most people buy book-cases 'off the shelf' as it were; and pre-prepared bookshelves are designed more for paperbacks than tomes. One of the maddening things in life is when a book doesn't warrant a place in the 'tall book' space but doesn't quite fit in the 'ordinary' space either. This one is thick (about an inch and a quarter?) but isn't too tall for an ordinary shelf. It's a work-person-like thing. The paper is lovely. 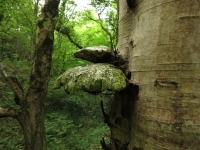 And the pictures are - well, fantastic. There are masses of simple and elegant drawings (or maybe they are photos made to look like drawings) along with enough photographs to give it a more real-life appeal. And there are necessary diagrams. It has a substantial index (good) a list of suppliers (not sure about that - it's bound to be a bit biased) and a year-round 'Saladini Chart'. Saladini (this is new to me) is to do with creating a salad with leafy bulk, sharp flavours, interesting colours and interesting textures. So if you want your salads like this it's useful to have sowing dates so everything can be kept in balance. BUT (here's my one criticism) - the writing in the chart is small (even when wearing my old glasses) and pale; the lines are close together and the colours confusing. One criticism isn't bad though? I haven't read everything. But I have dipped in and out enough to think this is a 'keeping' book. 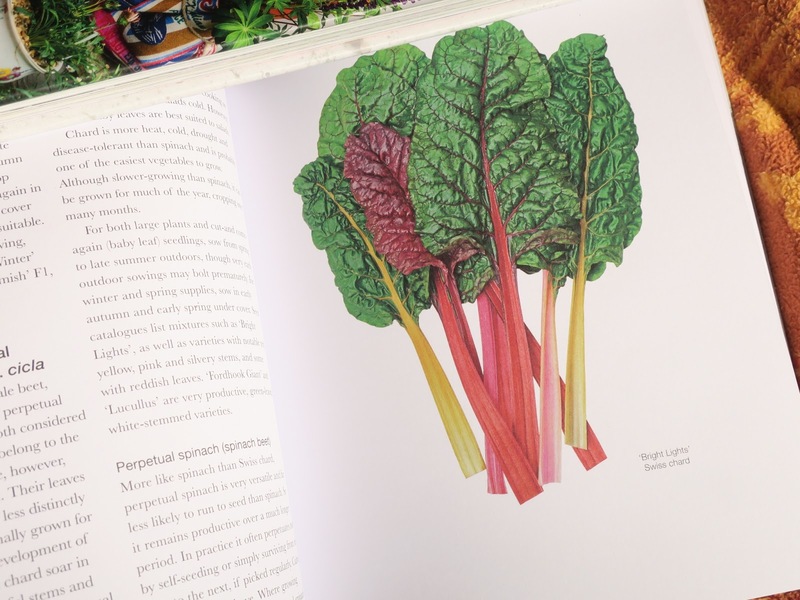 It's lovely to hold, fits on an ordinary shelf, has beautiful illustrations, loads of information and will be handy for starters and middlers alike. (I reckon.) I took it on holiday with me. I'll have to learn to stop carrying it around. Yea. This is a good one. Love this review, Lucy. 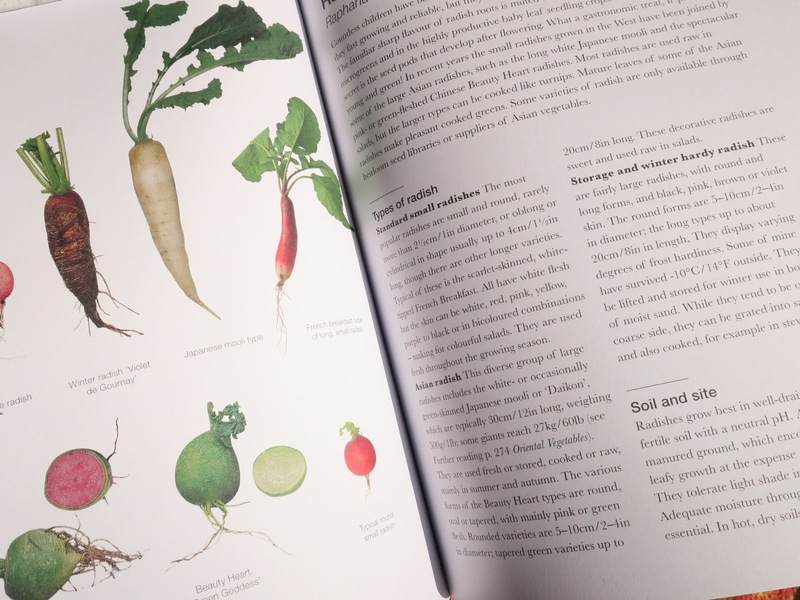 And even though I'm an experienced gardener, I do love my reference books and always appreciate the look, paper thickness and smell. Whether glossy or matte makes a big difference too. (I prefer matte.) I'm rather wishing that I'd been sent this for review ... but will check it out on Amazon instead! That looks like a beautiful book. I love books too but I find I have more than I need, so sometimes if I think I won't read one again, I take a deep breath and take it to an op shop. Sometimes later I'm sorry and regret it. Many of my friends don't read real books any more, they just use kindle or nook or whatever. But I still love books, made from real paper, they feel good. The advantage of downloaded books, of course, is that you can make the print bigger. Hope you get used to your new glasses soon - and people around get used to you looking like a spy!